DONATE FOR ITEMS ON THE WISH LIST! THANK YOU SO, SO VERY MUCH to all the wonderful people who have been participating in this ongoing fundraiser. Because of your fantastic generosity and support, the school has been able to plaster its walls, cement its floors, and obtain access to ELECTRICITY! They've also been able to purchase two computers, two UPs, and one printer. 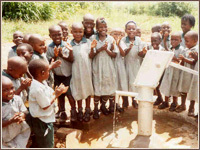 Donations made in honor of Gillian's 38th birthday went towards a classroom block and several months later, the borehole project was completed. Just before Christmas 2007, twelve full year scholarships were donated to the school. In April 2011, an Australian fundraiser and an auction of autographed photos raised the necessary amount for a much needed teachers' housing unit. Our current fundraiser is for a whole variety of items still on the wish list. To make a donation, please visit our donations page. We greatly value the flexibility and generosity of donors. Because the school is new and growing, we can help best by regularly adjusting our goals according to the school's most urgent needs. Thank you for your patience and understanding! 4/21/11: Funds for a Teachers' Block! Alinyiikira Junior School started in 2004, with a mission of providing quality education to school going children, for a better future. In its inaugural year, (2004), we started with 58 pupils, 7 teachers and 3 non-teaching staff. Currently the number of pupils stands at 123, 10 teachers and 3 non-teaching staff. The idea of starting this school was mooted by the chairman of the management committee, who saw the need in the area, where children of school going age were either not going to school or not getting quality education to enable them get good grades to take them to the next level. He shared this idea with the local leadership of the area, who embraced it. The idea was to start a vocational school which could take on those that have either failed to go to secondary schools or children who may not be able to continue to the next level but at least attain some vocational skills when they are still in primary, that could help them to be self reliant in future.